An epidermoid cyst is usually a slow-growing lump that can move easily under the skin. These cysts are closed sacs and sometimes a small opening or punctum can be seen on the surface of the skin which can drain grayish-white, cheesy, foul-smelling contents. If you express these contents, they will just reaccumulate. These cysts often have a bluish discolouration below the skin. In most cases, epidermoid cysts can be ignored, as they are not dangerous. If a small cyst becomes inflamed, the dermatologists at Atlantic Dermatology and Laser will inject it with intralesional corticosteroids to reduce swelling. If the cyst becomes infected, then the skin on the area of the cyst may be red and/or warm and may need to be treated with oral antibiotics. Larger cysts may need to be removed if they are unsightly and easily seen by others or if there is secondary infection. 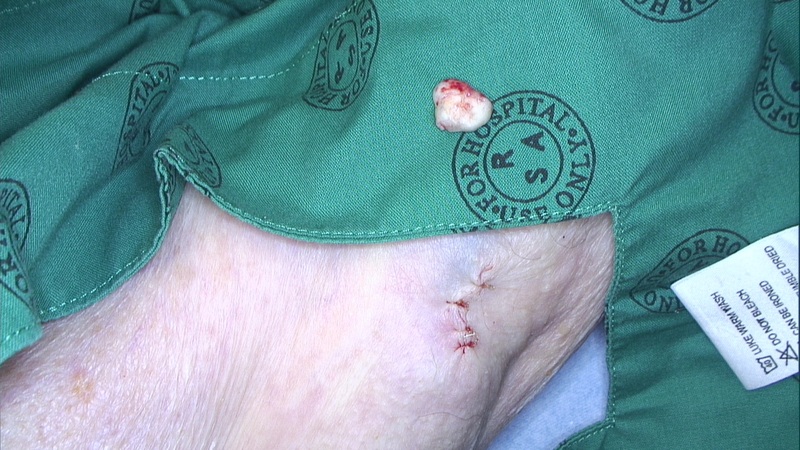 If required, the cyst can usually be easily removed by a simple operation under local anaesthetic. The surrounding skin is numbed by injecting some local anaesthetic and then a small cut is made over the cyst. It can then be gradually teased out followed by suturing the skin back together. This will result in a small scar but we will supply you with detailed post-procedure instructions in order to minimise scarring and ensure the best cosmetic outcome. We take great care in removing the whole of the lining of the cyst during the procedure (think of the cyst as a balloon under the skin) as opposed to just expressing the cyst contents. This is essential to prevent the cyst from recurring.